Florian Cafe: Don't Skip Skippyjon! Two weeks ago, while recording an interview at 30 Rock for NBC Learn, I had the pleasure to meet Judy Schachner, author/ illustrator of Skippyjon Jones, the best-selling character of several picture books, including Skippyjon Jones in the Doghouse. The funny thing is, among many other funny things, Skippy is not even a dog. He's a siamese cat who imagines himself a chihuahua, El Skippito. When I go to schools and ask first graders what they're reading, Skippy's name invarioubly comes up, along with much laughter. These books have a great rhythm, pace, and plenty of surprises. I loved when Skippy wrote and doodled on the wall (his mother Junebug Jones was NOT amused). All the Skippyjon books (the latest entry is Skippyjon Jones: Class Action) are great for reading out loud and for holding up the beautiful illustrations. There's plenty of PUNishment, alliteration, wordplay, and Spanish words tambien! As Kirkus Reviews said: "Ay caramba. Mucho fun!" 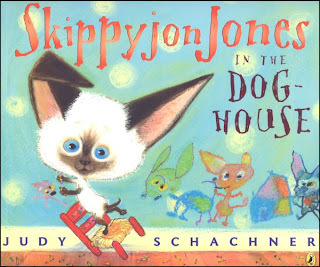 Skippyjon Jones is mui mui fun to read aloud. Love the intermixing of Spanish along with the English. Seriously, who doesn't like occasionally talking in a cartoonishly poor Spanish accent while playing the role of a cat fancying himself a dog?